If you’ve ever looked into competitor analysis frameworks, you’ll probably have heard of competitor SWOT analysis. If you’re trying to make a business decision of any kind, a SWOT analysis helps you pinpoint your position in the market, providing a solid foundation for making informed moves. Well, SEO strategy is no different. In particular if you’re a small business kicking off your SEO strategy against competition from businesses with greater resources, competitor SWOT analysis could be an invaluable tool. It could maximise the ROI of your SEO strategy and help you to make informed SEO choices when it comes to content, keywords and direction. But what exactly is it and how could you leverage it? What is competitor SWOT analysis? It’s essentially a decision-making tool. 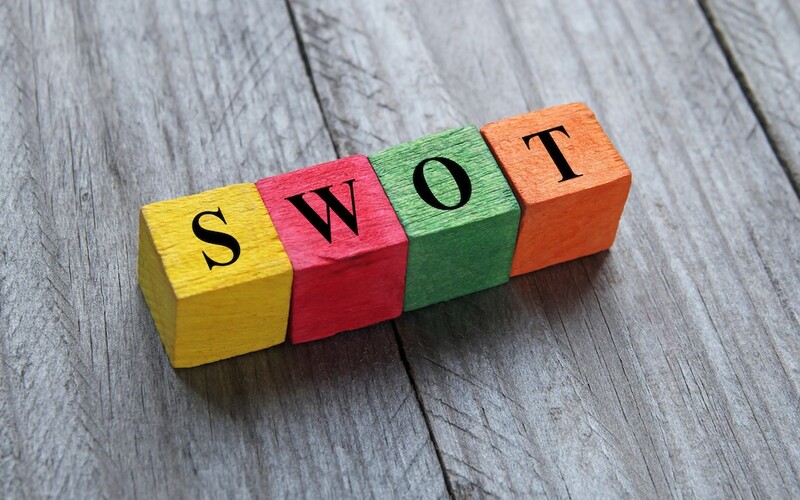 SWOT is a competitor analysis framework developed by consulting firms to gain an overview of a current business situation before putting together corporate strategy. SWOT stands for Strengths, Weaknesses, Opportunities and Threats. Strengths and Weaknesses refer to internal factors that are particular to your organisation or project, whilst Opportunities and Threats are external factors which depend on the environment of your organisation or project. Simply put, create a grid with a box for each of these four elements, fill it in using data and information you have available to provide instant insights into the context of your decision. How could I use this for my SEO strategy? Deciding on an SEO strategy for your business can be difficult. You’ll need to decide on the keywords you want to rank for, which type of content to produce, where to publish it and so much more. Before jumping into any of those decisions, a competitor SWOT analysis could help you identify what your focus areas for your SEO should be. It’ll also let you pinpoint some quick wins, so you don’t waste your efforts. Let’s take your decision on the type of content you want to produce. Start by completing the matrix with, for instance, the types of content that are your strengths and weaknesses in terms of SEO. Maybe your videos are ranking well, but your blog posts are struggling in search results. Then identify areas you could move into as opportunities, and the types of content that represent your biggest threats from competitors. This can then inform your decisions as to which type of content you want to produce next as part of your SEO strategy. A SWOT matrix could also help you identify keywords for your business. By inputting the keywords you’re already ranking well for in the Strengths field, and those you’re struggling to rank for in Weaknesses, you’ll gain an overview of where you’re at now. In the Opportunities field, identify keywords that have a good search volume but relatively low competition that are unique to your competitors’ domains: these are potential keyword options for your business in future. For Threats, define keywords unique to your domain, but that could be opportunities for your competitors in future, presenting challenges to your ranking for this keyword. This gives you a map of four different sets of keywords with their own liabilities, costs and strategic value to your company. When selecting keywords to rank for in your content, a competitor SWOT analysis matrix specially made for keywords could help you make informed and sensible keyword choices that are tailored to your company. Competitor SWOT analysis can help you to collect your research in a structured and visual way that’s easy to present to others. It can help you make decisions that are specific to your company’s standing and specific business environment. When developing your SEO strategy, it can help you to pinpoint areas that will be useful and provide ROI for your business, from identifying keywords to deciding where to publish your content. It’s a simple but highly valuable tool for developing an SEO strategy for your business.